Be the envy of the crowd! 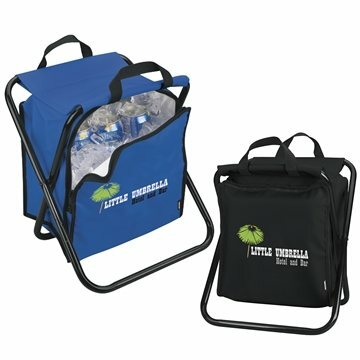 The Kooler Chair is perfect for the beach, a picnic or any sporting event, as it consolidates refreshment and relaxation needs into one great item. KOOZIE Kooler bag with double zipper and mesh pocket on back. Heat-sealed compartment holds 12 cans plus more. Materials: Seat: 210D Polyester, Frame: Powder-Coated Steel. A good give-away that is attractive and inexpensive. Our staff really liked them, especially because it was customized. Prompt delivery. Product met expectations. the product arrived SO much faster than I thought. Everybody loves them. samples were received promptly. Order was taken quickly and delivered on time. Thank you!! the order arrived on time. The company worked with us a special order delivery. The items was of great quality and color. Very nice. this was a great hit! We had our company logo printed on them and the colors are so vivid.